The strings feel good out of the packet, like they might have some brightness to them. It’s clear there is going to be some grab – the shape of the mains make it pretty obvious that’s the point. The performance nylon for the crosses….feels like nice performance nylon. They scream 21st century groundstrokes. We figured we would try our Prince Precision Longbody 730 – a fairly stiff and stable racket. We went with 58 on the poly mains and 55 on the nylon crosses. We brought the Vipers to Plaza Tennis in North Berkeley – one of the modern wonders of the world, in our opinion. Everyone needs a Plaza Tennis in their neighborhood. The Vipers apparently made some noise when being strung – “Those strings are going to have an effect – they gave off some really cool vibrations.” Sweet. Well, the Clarke Pit Viper does play nice. You get some unexpected surprises. It plays smooth and soft – especially after about 30 minutes when the strings open up a bit. You feel like you can control the velocity. When you do dial it up, the ball really sits on the strings. You can hit a heavy ball without losing control. You get the same power as gut, but you’re spending energy on dialing up the power instead of down. With the brightness of gut you can sometimes get away with being a hair behind the ball. Not good habits – but inevitable. We don’t find the poly blends quite as forgiving in this way. As a hybrid, the Pit Viper provided some brightness – but half volleys and punchy net play lost some touch. Groundstrokes felt great. There is definitely “grab” but it’s not extraordinary. Top spin came pretty easy. Slices not as dramatic a difference. We didn’t quite feel the extra grab on kick serves, but it felt great on flatter serves. The softness of the string combo and controlled tension pays off here, while the nylon adds some power. Is it an everyday string? We think it could be for an advanced player committed to hybrids and a string targeting controlled power from the baseline. You want a stiff racket to keep the Viper at bay. We felt some flex on it on a played-in Prince 730. We could see it playing nicely on the Wilson 6.5 – another steady hitter. If you see the Pit Viper, handle with care and give it a try. 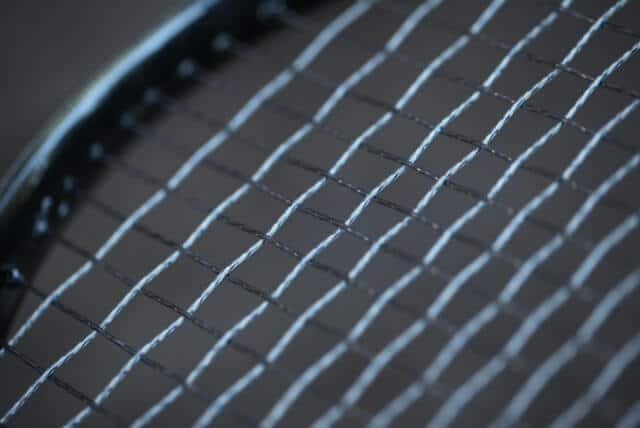 These strings were playtested by the folks at TennisFiends.com, the makers of some really awesome tennis t-shirts.